All Season Pass content, except the six post-launch Heroes and their elite outfits, will be available at launch on February 14th, 2017. 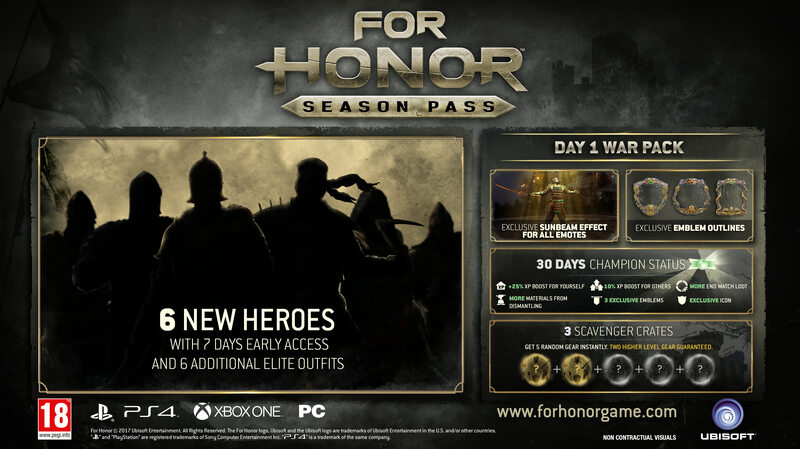 The new Heroes will be progressively released by batches of two at the beginning of a new Season of the Faction War – the persistent cross-platform meta-game that will evolve the war across the For Honor world. After this early-access period, these Heroes can be unlocked via Steel, the For Honor in-game currency given for completing matches and in-game challenges. Additional free content will also be released across three Seasons following launch. This post-launch content, including new maps, modes and gear, will be available for free to all players. Season Pass holders will receive an early access to some elements of this post-launch content.